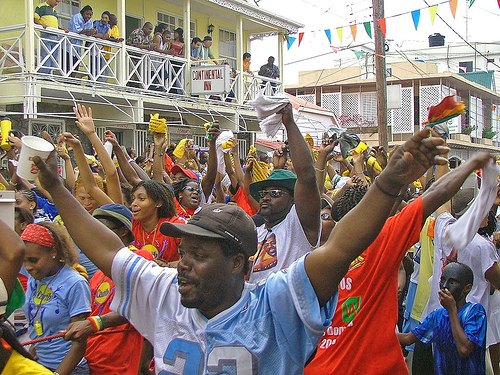 Trinidad as the undisputed biggest Carnival of the Caribbean has a unbelievable high output of Soca and Island Pop between December and February on a astonishing professional level. Most artists and production studios work literally around the clock during that period. We have repeatedly reported about new releases coming outta Trinidad. Anyway, there’s more than Trinidad Carnival: many other islands and countries of the region celebrate their “time of the year” – as in the traditional European – also before lent. We picked a few tunes from Colombia, Dominica, Guadeloupe, Haiti, Martinique, St. Kitts (although Carnival in St. Kitts was already done 1st of January) and the Caribbean community of El Callao in Venezuela. We will continue this article as soon as more studio versions of Carnival music are available. So much more to discover – from Curacao to Carriacou. Let us know in the comments which tunes you like and which we forgot! Dominica, the beautiful nature island located between the Frensh island Martinique and Guadeloupe, is the motherland of Bouyon music. Bouyon was created decades ago by Rah and the band WCK and combines traditional music with modern Soca and Rap. Recently it got very popular on Guadeloupe as Bouyon Gwada. Beside the omnipresent Dancehall, local Rap and Bouyon Gwada, Guadeloupe managed to preserve it’s rich musical heritage. Carnival is the time not only of the Gwo ka druming but also of a fast Zouk-style traditional marching band sound which might sound familiar for many European ears. Fowko put himself on the map with parodies and fun songs. The dance instruction tune “Bouyon Danse” was released last summer, but still it can be heard on the road during the Carnival events. Despite the political unrest and the big earthquake Haiti has a very lively music scene. Most of the artists are highly popular in the Haitian diaspora living in the USA – but when it comes down to Carnival, dozents of songs – Kanavals as they are called, are released. Kanavals are musically something very unique – a fast trip into madness – based on Kompa, often with many changes in tempo and key. And – let’s not forget: Haiti is the only country in the world with a famous slackness compa singer as president. In the 50s people from mainly Trinidad went to El Callao in Venezuela for working in the gold mines. And no surprise – they brought their culture with them which is preserved till today: Calypso and Carnival. We picked a tune by The Same People – but there are more bands, like Nueva Onda, The Young People or Nueva Generacion.